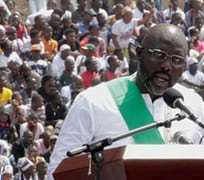 George Weah has been sworn in as the 24th President of the Republic of Liberia. "The mandate that I have received is a mandate to end corruption. It is time to put the interests of our people above our own interests and ensure that our country's resources do not end up in private pockets. "We must pay civil servants a living wage so that corruption is not an excuse because you will be prosecuted to the full extent of the law. "I promise to do everything in my power to be the agent of positive change. But I cannot do it alone. I call on the legislature to work with me to pass laws that will complete the foundation of our nation. "We are all overwhelmed with joy," said Janjay Jacobs, a former midfielder and now coach who played soccer with Weah on Saturday. He said Weah can bring growth and development to Liberia. "He has been a very inspirational person, very much motivating, never gives up in any situation," Jacobs said. "If all odds are against him, he still stands up for what he believes in."